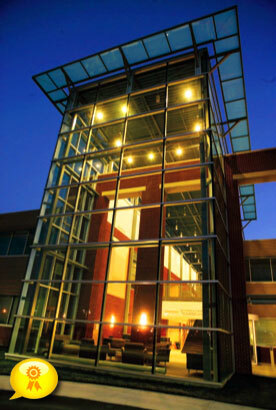 The Tri-Cities Higher Education Center was the first building completed at the MAST Center at Hampton Roads Crossing. The design-build team had only nine months to deliver this facility prior to the beginning of the September 2007 class schedule. The building was delivered on time and on budget and met the full expectations of Old Dominion University. The buildings design reflects an international style of architecture and has as its focal point a dynamic two story glass atrium that serves as both an iconic and organizing element. This 53,000 s.f., two story, masonry and glass structure provides the classrooms, meeting rooms, offices, and administrative space to support the dynamic growth of Old Dominion Universitys course offerings in the western part of the Hampton Roads region.